About a month ago, I was volunteering at my kids’ school, putting together packets of information for the staff. As I was finishing up, I realized that we were short on one of the handouts. The preschool director apologized and explained that she’d been trying to avoid making extra copies because, due to budgetary cuts, she’d been paying for the ink cartridges out of her own pocket. This really bothered me. It certainly wasn’t a shock that teachers often buy supplies for their classrooms, but I had assumed that this amounted to an occasional set of markers or play-doh, not something as pricey as an ink cartridge! I did a bit of research and found that teachers at our school aren’t the only ones dipping into their own pockets to keep their classrooms functioning. During the 2012–13 school year, the average teacher in the United States spent $945 on materials for the classroom! And it’s not just teachers in poorer school districts who are shelling out their own cash. 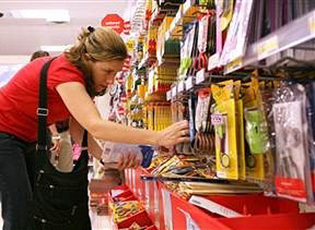 Nationwide, fully 99.5 percent of teachers spend their own money on supplies for their classroom. I felt strongly that I had to do something to help our staff. Every year during the holidays, our PTO organizes a cookie exchange for the teachers. So I suggested to the preschool director that maybe, instead of cookies, the parents should contribute baskets of needed school supplies. Her eyes lit up, and I promised her that I’d figure out a way to make it happen. As I started to worry about the logistics of organizing a school-wide supply drive, it hit me that I had the perfect resource at my fingertips: SoKind Registry. New Dream’s new registry service lends itself perfectly to organizing a big holiday undertaking. Because it’s entirely customizable, I could include any type of supply that the teachers requested, from paint sets to tissue boxes. Moreover, they could request secondhand items as well as gift cards and funds. Plus, they could request gifts of time and experience—a perfect way to solicit volunteers—which made me feel better because I had worried about asking parents who were struggling financially to buy school supplies instead of baking cookies. Parents could, for example, sign up to sort the teacher’s bookshelves or help prepare art projects. These gifts would be far more useful than yet another “best teacher” mug or keepsake ornament. Once the wishlists were created, I would compile them into one SoKind registry (see a sample registry here). Parents could then browse through the list and sign up for one of the gifts—just like shopping from an online wedding registry. We would collect the items during the second week of December and assemble an attractive basket of supplies for each teacher. For the non-material gifts, we would include cute gift cards that stated the gift request and who had fulfilled it. Unfortunately, our PTO didn’t manage to get approval from the principal in time for this holiday season. But I’m not waiting until next December to make sure that our teachers get the supplies and help they need. I’m currently seeking approval to create an ongoing wishlist for teachers for the start of 2014—to ensure that our preschool director, and her generous colleagues, never have to buy another ink cartridge for the school again. Edna Rienzi is a New Dream volunteer and the lead program coordinator for SoKind Registry.